October 7th is College Student Sunday! The Assembly of Bishops has designated the first Sunday of October, in conjunction with OCF’s Orthodox Awareness Month, as the date for College Student Sunday. For 2018, this falls on Sunday, October 7th. Click here to read the Encyclical from His Grace Bishop Gregory of Nyssa regarding College Student Sunday 2018! 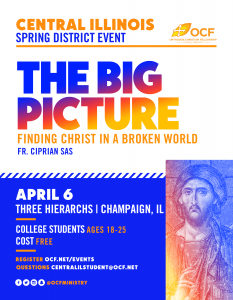 On this Sunday, we ask that your parish recognizes its college students by allowing a student share their experiences in OCF. We also ask that you take a special collection to continue supporting the vital ministry of Orthodox Christian Fellowship. Click here to check out where the 2018/2019 Student Leadership Board will be presenting this College Student Sunday! Checks may be sent to: Orthodox Christian Fellowship, 50 Goddard Avenue, Brookline, MA 02445 or donations can be made online by clicking the button below. Students! Are you presenting for College Student Sunday? Check out this outline for ideas about what you can say to spread the word about OCF!